With hemp production and consumption on the rise, how much will genetic engineering play into hemp’s development as a commodity crop? Originally published in Issue 5 of HEMP. Subscribe HERE or find in a local grocery store. What do Monsanto and GW Pharmaceuticals have in common? One multinational company: Bayer Pharmaceuticals. In 2003, the pharmaceutical and life sciences multinational giant entered into an exclusive marketing agreement with GW Pharmaceuticals, the manufacturers of the cannabis-plant-based pharmaceuticals, Epidiolex and Sativex. Fifteen years later, in May 2018, Bayer Pharmaceuticals purchased Monsanto, an agrochemical company most notable for their investments in genetically modified organisms (GMOs). The question is: Will the merger spark the introduction of genetically modified hemp, or does it already exist? For millennia, humanity has selectively developed traits in plant and animal genes to achieve a desired outcome through a process called selective breeding. The cannabis species is no different. Over thousands of years, farmers across the globe have selectively bred hemp, which led to an increase the concentration of its intoxicating cannabinoid, delta-9-tetrahydrocannabinol (THC), creating modern-day marijuana. Today, selective breeding is essential for creating consistency in the hemp plant, especially considering that entire harvests could be ruined if a hemp crop produces more than the legal limit of THC. According to Dr. Ron Turco, the department head of agronomy at Purdue University, a crucial difference between hemp and traditional crops like corn and soybeans is that we can now easily grow traditional crops because we’ve had decades to work with them — decades to selectively breed for traits such as seed size, plant height, and time to ripening. Selective breeding creates uniformity in crops that ease planting and harvesting operations for farmers, which in turn, increases on-farm revenues. Unlike the elongated process of selective breeding, genetically modifying or genetically engineering an organism — defined as inserting genes from one entirely different organism into another — did not begin until the 1970s. It wasn’t until over twenty years later, in 1994, that the first commercial genetically edited agricultural product, the Flavr Savr Tomato, hit store shelves. Since then, Monsanto and other agrochemical companies have invested in research and development to improve the growth and harvest of major cash crops, particularly corn and soybeans, by implanting the genes of bacteria or protein to help protect the crops from weeds and insects. Conversely, hemp hasn’t experienced the same path of genetic modification. Dr. Turco is skeptical that any genetically modified hemp is currently on the market or even being widely researched today. University of California, Davis might be the first institution to crack the code for modifying hemp varieties. The school has teamed up with Colorado-based agricultural biotech company, Front Range Biosciences. Together, they’re attempting to map the hemp genome so that agronomists and biologists can have a reference code when they selectively breed hemp, or when they start to genetically modify the plant. Understanding the genome will allow for improvements in identifying plant behaviors and traits, which will then allow cultivators to select new varieties that require less inputs like water, pesticides, and fertilizers. If GMO hemp did exist, it could potentially help ease production concerns. However, regulatory hurdles continuously prevent the crop from reaching its potential. One of those major regulatory hurdles in the U.S. is the demand for farmers to maintain THC levels below the 0.3 percent threshold. If the Department of Agriculture tests a farmer’s plots and finds the THC content above 0.3 percent, even if by accident, the plot must be destroyed. This creates a large risk considering the efforts and expenses necessary to grow the crop, such as application fees, land use, labor, and fertilizers, combined with the opportunity cost of not growing more reliable crops and not having insurance to cover the lost hemp in case of destruction. Plant breeders like Colorado-based New West Genetics are counteracting this risk by selectively breeding hemp for specific traits, like low THC. Mosher says the company isn’t opposed to GMO crops, but they’ve experienced genetics equally as stable using traditional breeding methods, so their goal with hemp has always been to follow the traditional breeding path. Dr. Turco believes removing the THC compound from the plant could be an area where genetically modified hemp could play a significant role in the future. “That could have a major impact on the discussion of what is hemp and what is marijuana,” explains Dr. Turco, saying that it would be feasibly possible to create a THC-free knock-out mutant where the THC would never come back or a mutant that would only make CBD. “So, it wouldn’t necessarily knock out the THC — you just wouldn’t allow it to happen,” Dr. Turco says. In addition, companies must pay tens of millions of dollars in approval fees and commercialization costs to get the genetics to market. Dr. Turco says that researchers have begun to investigate GMO hemp, but completely removing THC from the plant is just a scientific question at this point. While some researchers are busy understanding ways to improve the plant species to reduce risk and agricultural inputs while increasing harvest yields and cannabinoid content, others are forgoing the plant altogether and focusing on engineering cannabinoids, like CBD, biologically. 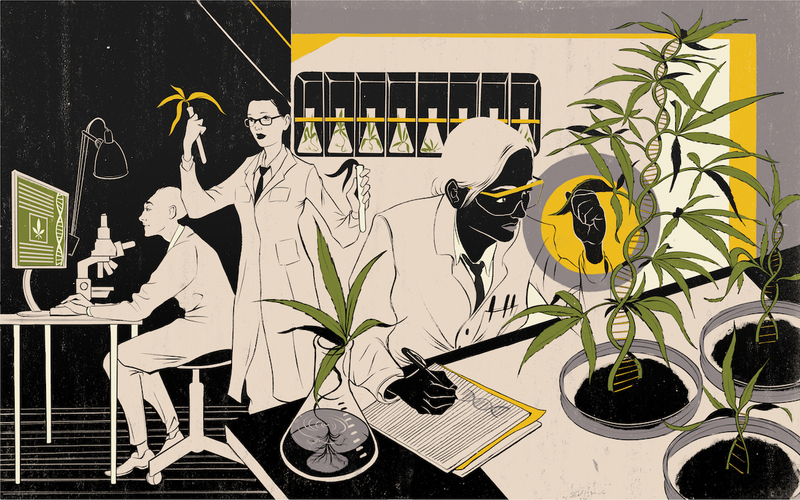 Kevin Chen, CEO and co-founder of Hyasynth Bio, a Canadian company founded in 2014, thinks the long-term demand for cannabinoids, especially for pharmaceuticals, will never be met by current hemp-production methods. Instead, he believes his company can meet the demand by biosynthesizing cannabinoids — growing them in yeast as opposed to soil. In this case, the plant is not even necessary. The cannabinoids themselves are not genetically modified like a Monsanto seed, nor are they chemically synthesized like the synthetic-THC pharmaceutical, Marinol. Rather, the DNA of yeast is modified to create cannabinoid-producing yeast strains. This technology isn’t new to pharmaceuticals; in fact, the process is similar to how manufacturers produce insulin. To grow cannabinoids on yeast, companies and researchers like Hyasynth Bio can order DNA sequences from DNA synthesis companies. The DNA synthesis companies send the physical DNA, which can be in a dry powder or liquid form, directly to Hyasynth Bio. The cannabinoids are chemically the same compounds of those grown and extracted in the plant material, they’re just created in a different manner. The effectiveness of biosynthesized cannabinoids in comparison to plant-based cannabinoids hasn’t been scientifically studied. However, biosynthesized cannabinoids bring a lot of benefits to the cannabinoid space, particularly when it comes to medical applications. Because the process is based on fermentation — a process that is already used for fuels, pharmaceuticals, food, and cosmetics — the operations are currently scalable, particularly when considering maintaining quality control, finding experts, and building equipment. Less space means less impact on the environment and more efficient production, so that compounds like CBD can reach the broader population who are seeking it for medical or therapeutic benefit. “It’s our goal to take all the benefits that we know about from phytocannabinoids, and use a scalable technology, like fermentation, to make sure that anyone on the planet can access these benefits,” Chen says. Chen also thinks in the long term, biosynthesis will make it easier to manufacture minor cannabinoids that are more difficult to extract from the hemp plants, which could open new research and development for future pharmaceuticals or be added to current hemp extracts already on store shelves. With the FDA approval of GW Pharmaceutical’s Epidiolex, a drug derived from the cannabis plant, other pharmaceutical companies are sure to follow their footsteps, but will these companies use hemp plants in their natural form or their genetically modified form — or perhaps will they not even use the hemp plant at all?